In the game of Galloping Pigs players will be trying to keep their snouts ahead. When players use their cards at the right time they'll be rewarded with lots and lots of food. The more food you have the better. Pigs love food - so as you can guess the player with the biggest food supply at the end of the game will be the Galloping Pigs winner. 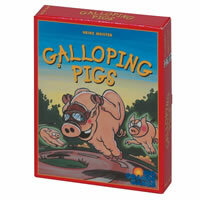 Galloping Pigs is a fast-paced card game that will be a lot of fun for the entire family. Be sure to check out Galloping Pigs today! In the game of Galloping Pigs each player, with his race cards, tries to create a really great race in which he has collected the most food cards at the end of three racing rounds. Galloping Pigs comes with 35 race cards (7 cards in each of the 5 colors of racing pigs), 22 race track cards, 55 food cards, 5 racing pigs (in 5 colors), and the official Galloping Pigs rules and instruction booklet. Please keep in mind that the official Galloping Pigs childrens rules and instructions could be different depending on the game version you have. The rules below are some of the exact directions on how to play Galloping Pigs. Share with us your comments, funny stories, tips, advice, strategies, creative ways to play, questions about how to play, problems with the rules or anything you want about Galloping Pigs. All submissions will be reviewed within 24 hours. Click here to add your Galloping Pigs comments.